Oatmeal Raisin Cookies are hard to beat. Their edges are crisp, their flavor is buttery sweet, and their texture is wonderfully soft and chewy. They are great for breakfast, as a snack, or for something a little special, use them to make a breakfast trifle. A breakfast trifle is made by crumbling the oatmeal cookies and layering them with yogurt and fresh or dried fruits. A perfect way to start the day. Jean Anderson in her book The American Century Cookbook tells us that the first recipe she found for Oatmeal Cookies was in the 1896 Boston Cooking-School Cook Book. That recipe, although called an Oatmeal Cookie, only contained 1/2 cup of rolled oats. During the Second World War, The Quaker Oats Company published a recipe for Oatmeal Cookies that called for shortening, as butter was in short supply. Today we like our cookies nice and buttery, so butter has come to replace the shortening. And we also like our Oatmeal Cookies bursting with rolled oats, so for this recipe we are using a whooping three cups. I like to use old-fashioned not quick-cooking rolled oats. I prefer their flavor and thickness. While both may start with oats that are cleaned, toasted, and hulled to become what we call oat groats, the difference between the two is in the thickness of the oats after the oat groats have been steamed and flattened. The pairing of Oatmeal Cookies with raisins is perfect. Although I like to use dark raisins in these cookies you could also use golden raisins. Both dark and golden raisins are simply dried Thompson seedless grapes. The difference is that dark raisins are sun dried which gives them that dark shriveled appearance, whereas golden raisins are treated with sulfur dioxide first to prevent them from turning dark and then air dried to keep them a golden yellow color. Raisins, like dates, have a high sugar content, and are a good source of vitamins and iron. Because of their high sugar content they retain moisture which keeps these cookies soft for several days. However, if you like you could replace the raisins with an equal amount of dried cranberries or cherries, chopped nuts, or even chocolate chips. 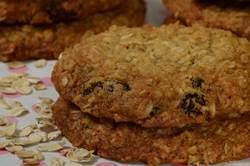 Oatmeal Raisin Cookies: Preheat your oven to 350 degrees F (180 degrees C). Line two baking sheets with parchment paper. Or you can simply butter your baking sheets or spray them with a non stick cooking spray. In the bowl of your electric mixer (or with a hand mixer), beat the butter until smooth. Then add the brown and white sugars and beat until creamy and smooth (about 2 - 3 minutes). Scrape down the sides of your bowl as needed. Then add one egg and beat until it's mixed into the batter and then beat in the second egg, along with the vanilla extract. In a separate bowl, whisk together the flour, baking soda, salt, and ground cinnamon. Add this mixture to the batter and beat until incorporated. Stir in the rolled oats and raisins. For large cookies, use 1/4 cup (60 ml) (60 grams) of batter (I like to use an ice cream scoop) and place six cookies on each baking sheet. Flatten the cookies slightly until they are about 1/2 inch (1.25 cm) thick. Bake the cookies for about 14 - 16 minutes rotating the cookie sheets halfway through the baking time. The cookies are done when golden brown around the edges but still a little soft in the centers. (The longer the cookies bake the more crispy they will be.) Remove from oven and let the cookies cool a few minutes on the baking sheet before transferring them to a wire rack to finish cooling. These cookies will keep several days at room temperature. They can also be frozen.